Our fully featured grading system allows you to enter grades and maintain classes easily and intuitively. Grades are auto-saved, preventing teachers from ever accidentally losing their data. Beehively allows teachers and staff to communicate what’s important with students and parents. Detailed email distribution records allow teachers to see when parents have seen and opened school emails. Grade from the gradebook feed into clear, customizable progress reports and report cards. Distribute reports to parents via email with a single click. Beehively lets you take Team Drive even further - allowing users without GSuite to access, download, and edit Drive files without leaving Beehively. Work either in Beehively or in Drive - edits will sync both ways. 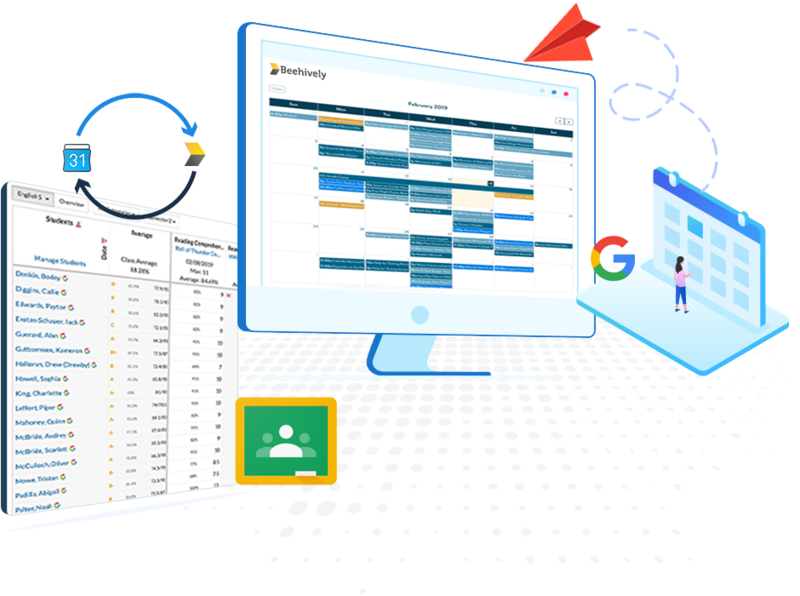 Integrate with Google Classroom, and synchronize your Google gradebooks with Beehively instantly. Google Classroom and Beehively work seamlessly to provide you more tools to create assignments and organize content. Use your Google Account to securely sign into your Beehively account. Never forget your password again. Sync your Google Calendar to Beehively and always be up to date on events. Message individuals or groups of individuals without leaving the Beehively interface. Our distribution system allows you to track when these emails are seen and opened. When an emergency happens, time and communication are key. 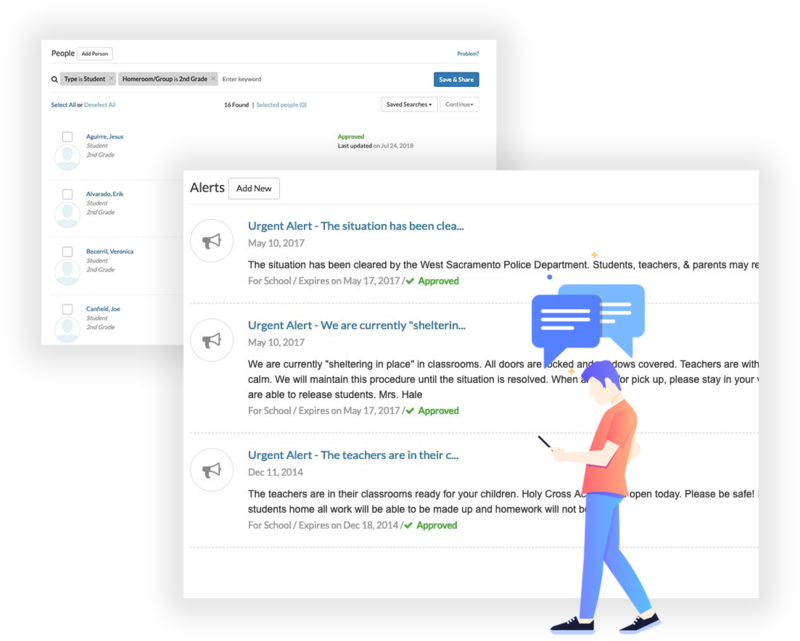 Our Urgent Alerts platform utilizes phone calls, texts, and email to reach all parents and staff, wherever they are. Schoolwide, classroom and homework calendars keep families in the loop 24/7. Parents are able to log in and view integral dates for both the school-wide experience and gain insight into their students’ homework and classroom events. Our support team is available to answer any of your questions over the phone during our business hours, and via email anytime. Our websites aren’t based on templates. They’re custom-crafted from scratch to meet your needs and make your school stand out from the rest. Our team of web experts will work tirelessly to ensure your site is beautiful, useful, and unique. We always design with mobile friendliness in mind. Using modern, responsive design, we ensure every page displays perfectly on every device. Need something changed on your website? Just let us know, we’ll do the heavy lifting for you. Our team is always ready to make changes large and small, with a typical turnaround time of under one business day. Unlike other website design companies, there’s no limit to the number of edits we’ll make for you. Want to dive in and make changes yourself? You are free to edit your website as much as you’d like, using our simple and intuitive Content Management System.